Elvis Presley, Emmylou Harris, Rosanne Cash, Patty Loveless, Lyle Lovett, Vince Gill, Reba McEntire, Brooks & Dunn, George Strait, Trisha Yearwood, Lionel Richie. All of these people have one thing in common: Tony Brown. Born to an evangelist father, Brown grew up just outside of Greensboro, North Carolina, playing piano and loving Gospel songs. What started as a gig in the Southern Gospel group The Brown Family Singers at the tender age of thirteen would blossom into one of the most prolific careers in the music industry. 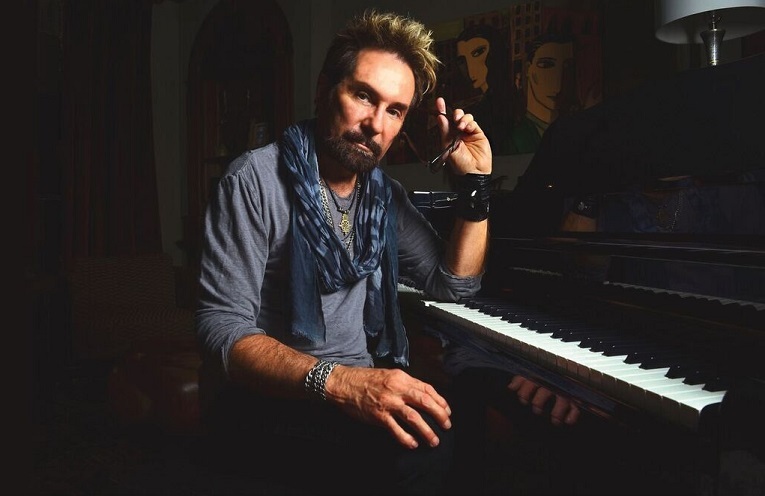 What is perhaps the best part about Tony Brown, though, is not the rich history he carries with him but his genuine love for music, his sense of humor, and the fact that he’s never met a stranger. After chatting for hours like we were longtime friends, I find it hard to put into words the effect this man can have on a heart. With a lot of jokes and even more anecdotes, Brown showed me what memory lane looks like when you’ve got over fifty years in the business behind you. 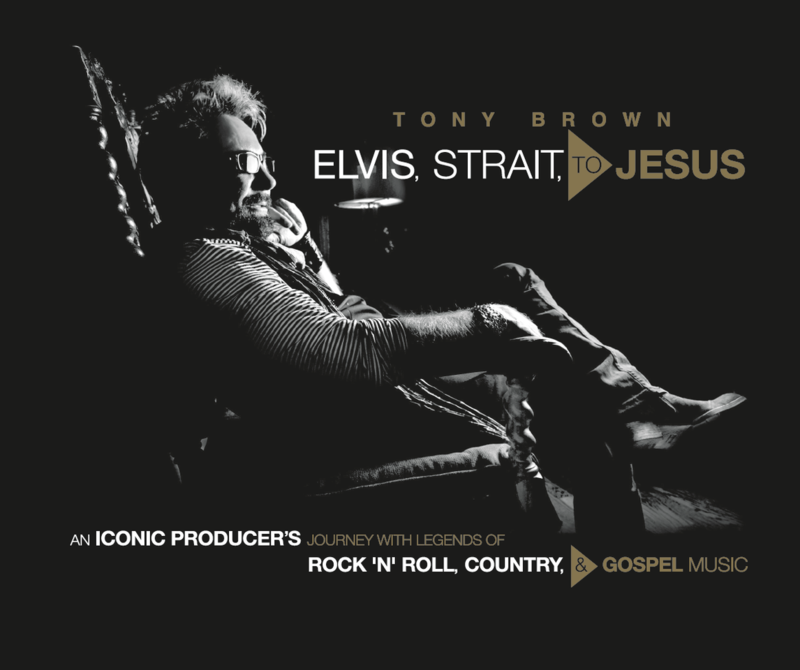 Brown’s story is captured beautifully in his new book, written in collaboration with Dead Horse Branding, titled Elvis, Strait to Jesus. There is strong imagery throughout the book as one turns the pages; there is photo after photo of music legend after music legend adorning an intricately carved French Renaissance throne like the kings and queens so many fans declare they are. It is often a close competition as to which is more striking: the chair, or the artist it is presenting. With some of Country, Gospel, and Rock and Roll’s best and brightest staring almost hauntedly into the camera, the chair becomes a deeper representation of Brown himself. Always in the background, acting as both a foundation and pillar to so many careers, it is easy to pick up on just who Brown has and has not produced. His hours in the studio have proven fruitful; there is a distinct and superior style to the music he helps create, no matter in which genre it happens to fall. Brown didn’t get to where he is without having an opinion and a keen ability to express it in just the right way, and that is perhaps what I admire most in him. Though Brown is known as one of the top executives in Nashville, producing is not what he first arrived in music city to do. “I started out as a musician, that’s what I really wanted to do back then. I came to Nashville to be a session player. Along the way I started paying attention and had the good enough sense to know that my musical skills were limited, but I did have a creative brain. The best place to be creative when you’re not a musician is Artist and Repertoire at a music label. In A&R you get to find acts, you get to help them find songs for themselves, and you get to produce them. I sort of lived my musician life through being a producer. As a producer I could say, ok, I want to do an album and I’m going to hire this artist from Los Angeles and cut it on them because I’ve always wanted to meet that person. Getting to meet an artist you like and work with them and work through them is amazing. People always ask me if I miss playing, and I really don’t.” In his career as a session musician, Brown played with some of the best artists to ever grace the industry, including The Oakridge Boys, Elvis Presley, and Emmylou Harris. Having a career as a musician before Brown turned his attention toward production served as a valuable lesson in cultivating his own personal style and sound; characteristics that would become deeply important to the work he has done with artists across multiple genres. “My first professional job was with JD Sumner and the Stamps Quartet when I was nineteen years old. I had made my goal—that was my goal—to play with him, and then that led to playing with the Oakridge Boys. You start looking at gigs in terms of questions like what does it pay and how do they look? How are they dressed and presenting themselves as a brand? All those guys back in those days, they dressed to the tens. They looked like riverboat gamblers. JD Sumner was like six feet seven and the world’s lowest bass singer, so I just wanted to be with him. He was my Mick Jagger or my Paul McCartney—he was my rock star. Then I left him to go with The Oakridge Boys. At the time they were this young Gospel quartet and they were dressed like they stepped out of GQ with their bell bottoms and platform shoes and long hair and I just thought they were so cool.” Brown stressed the importance of having a strong personal style, noting such stars as Dolly Parton, Lee Ann Womack, Alison Krauss and Reba McEntire. Whether it’s Parton’s sequined skirt suits, Womack’s bell bottoms and western tops, Krauss’ ethereal, lace and crocheted style that matches her voice perfectly, or McEntire’s tight leather pants and bedazzled fringe tops, audiences know exactly who and what these women are from the moment they step on the stage. Their personality speaks before they even open their mouths; an increasingly important characteristic in a genre that is continually watered down by Music Row. 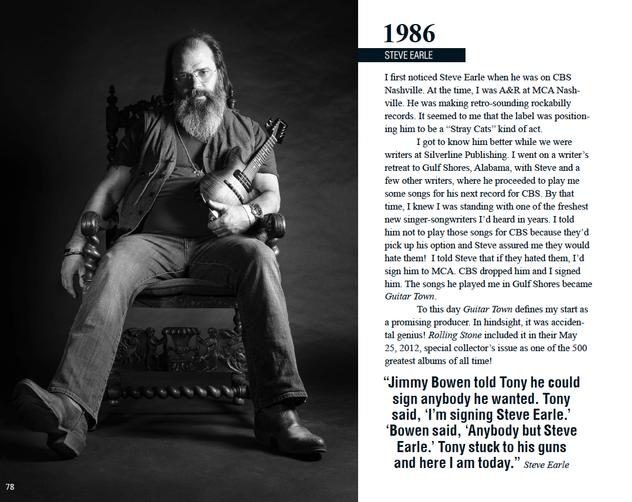 As we discussed the ups and downs of Country music and how he transitioned from a Gospel piano player to a Nashville music tycoon, Brown credited his love for Country to none other than Emmylou Harris—another artist featured in his new book as someone who had a profound impact on his life. After the sudden death of Elvis Presley, a day before Presley and his band were set to leave on tour, Brown found himself jobless and on his way back to Nashville. It was then that an opening for Emmylou Harris’ band led Brown down a path that would mark the rest of his career. “I got in this business because I love music. I didn’t even like country until I got with Emmylou. With Emmylou we’d be on the bus listening to Bluegrass music and she’d say ‘Tony, did you realize who you were playing for before you played with me?’ I’d of course say Elvis, then she’d take me through the history of who he was; his Gospel roots, his Country roots, all that. Up until my tour with her, I didn’t like country music, but I loved Emmylou’s voice. I also loved The Eagles and Linda Ronstadt, and of course Emmylou was part of that circle of artists. It wasn’t long before Brown found himself on the other side of the table when it came to music. 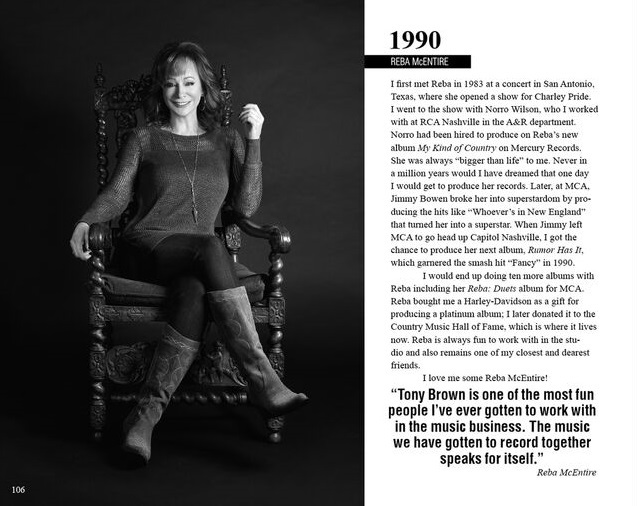 1984 was the year Brown’s life changed forever as he accepted a position at MCA Nashville under the strong direction of Jimmy Bowen. As Bowen took over MCA with an executive team he’d hired himself, he looked to take Brown from being a green session musician to being a seasoned and respected record producer. Bowen succeeded, to say the least. Brown joined Bowen’s team just in time to watch him transform George Strait and Reba McEntire into the icons they’re known as today. With artists like that to cut his teeth on, it’s no wonder Brown grew into one of the most effective and triumphant producers Nashville has ever seen. During his time at MCA Brown crossed paths with many of Nashville’s other greats, including Bruce Hinton, Walt Wilson, and Scott Borchetta. Together, with Bowen, that team would make MCA Label of the Decade and become an unstoppable force in Nashville and beyond. 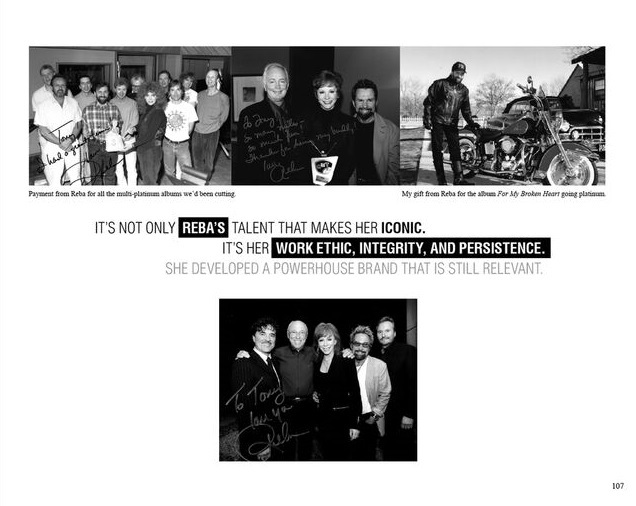 During his time at MCA and Universal South, Brown produced the likes of Vince Gill, Patty Loveless, Wynonna Judd, Brooks & Dunn, Trisha Yearwood, Joe Nichols, and Shooter Jennings, to name a few. His career has yielded over one-hundred number one singles, he holds four Grammy awards, and four Academy of Country Music Awards, including Producer of the Year. So where does a man go when he has achieved it all? Independent. He goes independent. With many wildly successful chapters closed and a whole host of accomplished friends in the business, Brown spends his days now as an independent producer for new acts like Emi Sunshine and Drake Milligan. One by one, Brown is building up a brand new repertoire of young artists who sound hauntingly like the old ones. Sunshine channels the heart and soul of Loretta Lynn and Tammy Wynette with deep, touching, relevant lyrics and a voice much larger than her fourteen year old body would have one believe, while Milligan croons as well as Hank Williams Sr., Elvis Presley, and George Strait all rolled into one young man. The music Brown is producing now will probably never see the light of day on mainstream radio, but that isn’t necessarily a bad thing as the pendulum swings between what has popularly become known as Bro Country and the more Outlaw styled, traditional, regional offshoots of the genre. As I stated before, Brown is a man with strong opinions and an even stronger style steeped in the rich culture and music history he carries with him, and he still makes both known in the industry today. “Everything is sort of becoming genreless now. Country crosses into hip hop and where it doesn’t, country sounds like seventies pop now. So our genre is bleeding. When I grew up in the business, it was different. Kind of like Lee Ann Womack has said, she loves the regional aspect of country and so do I. You can tell where people are from—Hank Sr. was from Alabama, Waylon was from Texas, Reba was from Oklahoma. You can hear that in their music. I think that’s important. Brown holds the keys to so much of Nashville’s storied history, and he still has a few tricks up his sleeve as he raises up a new generation of artists with profound talent and integrity. I, for one, can’t wait to experience firsthand more of the wonderful art he puts out by way of his keen vision for authentically good music. 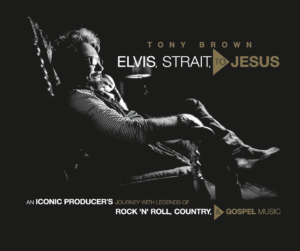 If you’d like to learn more about Brown’s career and see how a star in our industry is born, pick up Elvis, Strait to Jesus, available on Amazon, Barnes & Noble, and on Brown’s website. Each time one opens this glorious book, it seems as if the stories have grown even grander as Brown allows us to match him step for step on his journey to being an iconic producer with some of the biggest legends in Rock & Roll, Country, and Gospel Music.